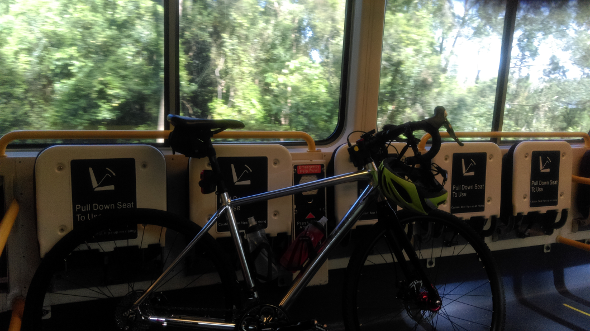 Unlike the last bike-plus-train write-up with a reference to rainbows in the title, the bike leg of today’s effort is a lot less epic though just as enjoyable. 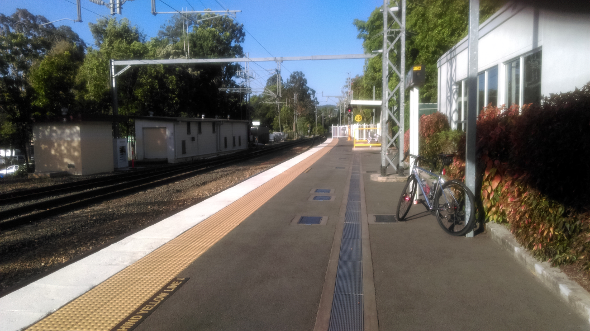 The point of the trip is a day’s visit to see someone on the Sunshine Coast which I would probably otherwise do by car so it’s also an experiment in non-car transportation alternatives. 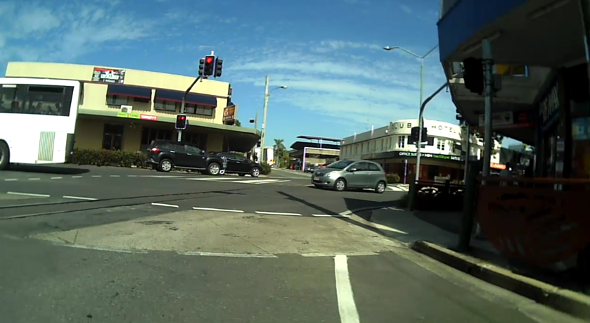 Spoiler alert – the result of the experiment is that, disappointingly, if you’re looking to get to the Sunshine Coast quickly, the car is your only real alternative. 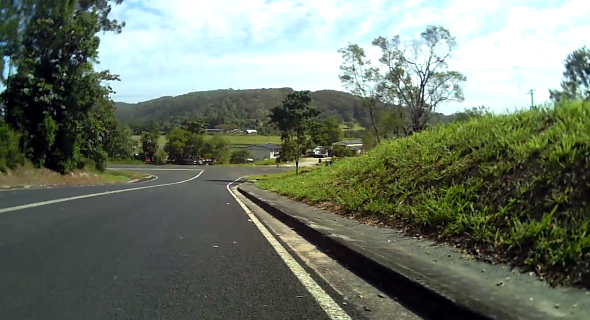 On the other hand, if you’re looking for an enjoyable day out with pretty well zero stress and great scenery along the way instead of staring up someone’s exhaust pipe while hurtling down the Bruce Highway, then traveling this way is definitely for you. I packed very lightly for the day cramming all that I needed into my trusty canvas sling bag – a pair of thongs to give my feet a break when I get there, phone, cards, deodorant, a spare battery for my headlamp and, of course, a cycling cap. That was about it. Being a definite low performance cycling day, I wore a very nothing-to-see-here cotton short sleeve button down shirt, a pair of shorts with some knicks underneath to prevent my arse from protesting and my very low key Shimano Click’R SPD shoes which just look like a pair of runners. The whole day was the embodiment of simplicity. 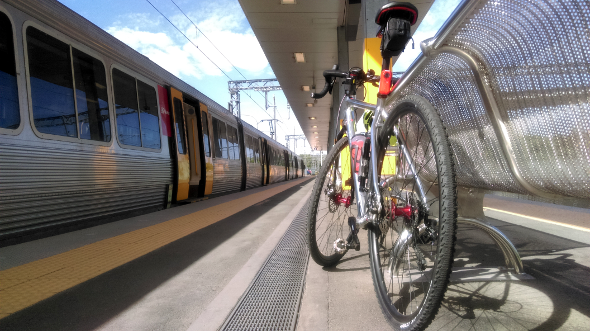 All that was needed to travel is a train fare, the contents of my bag and my bike – the responsibility of owning or needing to control anything else beyond that was discarded. In a sense, I become like a vagrant. I gave up several things perceived as conveniences in exchange for a hearty helping of true liberation. Maybe I’ve just been listening to too much Tom Waits. Leaving home not long after sunrise, I rode to the train station where I boarded a sparsely occupied carriage on the northbound train. 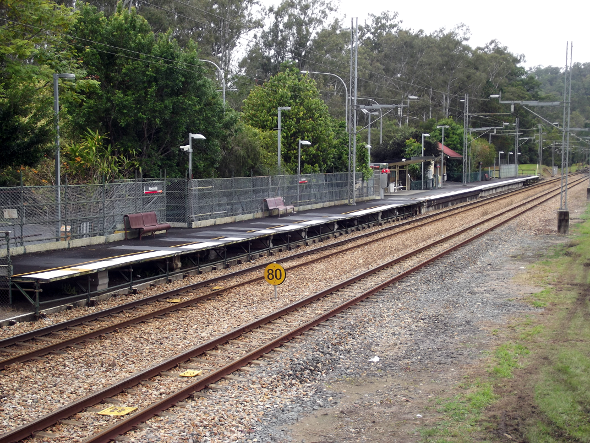 The further north we headed, the more the carriage emptied as people got off to get to their jobs and once we passed Caboolture station, I was one of only three or so people remaining onboard. From there, the scenery changed from suburban motordom to a mixture of crops, dense forest and small country towns with small, friendly looking stations. The Queensland Railways terms of service seems to change up here too (for the better, I thought). There were five to ten minute stops at the towns where people got off to stretch, smoke and chat to the railways staff. Being a pasty, nervous city type, I couldn’t overcome the unfounded fear of my Crossrip being left aboard the train as it took off without me so I didn’t get off like I should have which left me once again with fewer photos than I would have like. Besides taking in the scenery, there’s very little to do along the way. You can sleep, read, listen to music or eavesdrop on the conversations of others – a couple of old timers meeting for the first time and realising that they both grew up in the same timber getting region of NSW many years earlier, some students talking about upcoming exams, friends from neighboring towns catching up on a recent local social event. The train eventually rolled into town just as Nambour was waking up for the day though as far as peak hour goes, it was never really apparent I was in the midst of it as I rode through the main street with just a few local buses about, some tradespeople’s utes and a several other people walking to their retail jobs. Town passed me by quickly. 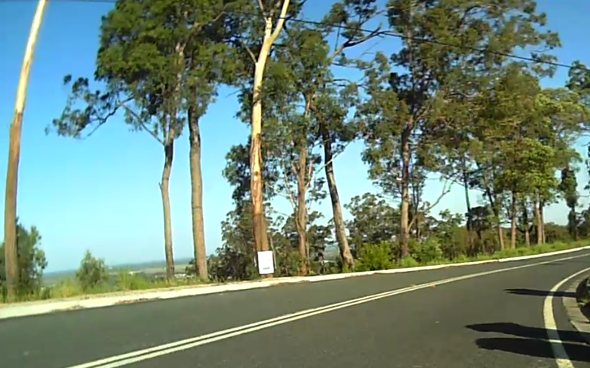 I climbed to the top of the hill on Howard St and looked back over the awakening town before sliding down the other side with the cool morning air blasting through the gaps between the buttons on my shirt and soon I was climbing again up Paynters Creek Road and into Upper Rosemount Road. There were almost no cars to share the road with here and the top of Upper Rosemount Road provided some distant glimpses of the mighty Pacific. 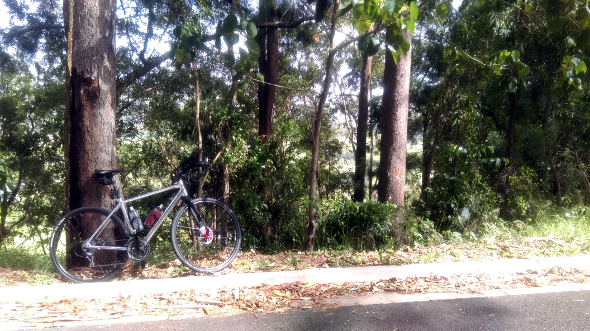 Before long, I was on the eastern side of Upper Rosemount Road and remainder of my journey into the Sunshine Coast proper to my host’s abode was all flat. Zero stress mode continued as I spent the day with my host taking in the obligatory Sunshine Coast trip to the beach and lunch but all good things must eventually come to an end and before I knew it it was time to head home so I retraced my path back along Upper Rosemount Road. 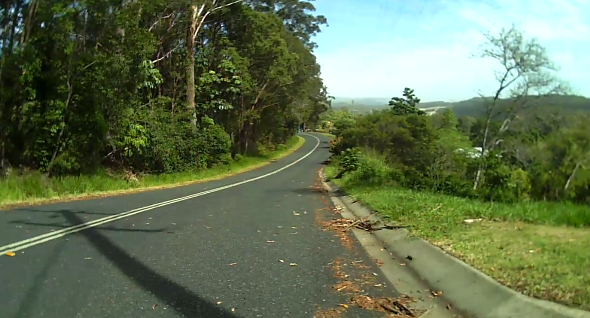 The climbs were a bit steeper on the way back forcing me to use the 28 tooth cog on my cluster for the first time in a while which was a fine way to work off my lunch and gain a different perspective on the scenery. Soon, I was on the Brisbane bound train as the last rays of the day’s sun flickered between the trees and into the carriage window like the final few feet of a film strip before it comes off the reel. Arriving back at my home station, the evening was well under way as I pedaled back in the cool of the evening with the full moon hanging over me like a giant bauble. I stopped at a local takeaway shop on the way home before reluctantly bringing the day to a close. Until next time, ride safe and enjoy. Nothing like a relaxing train ride to enjoy the views. Amazing pictures looks so clean. 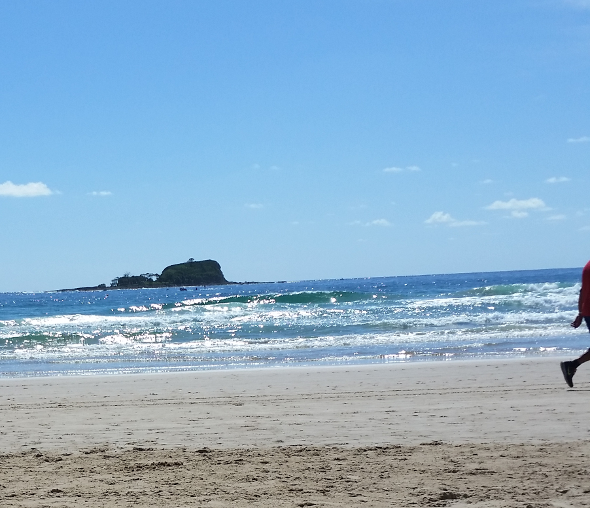 We definitely love our Sunny Coast. Lots to explore by bike.